When you arrive at the Jeju Island, deciding whether to stay in Sinjeju(신제주, I prefer Shinjeju since Jeju never committed a sin but Sinjeju is the official title) or Gujeju(구제주, Old-Jeju) depends on your choice. 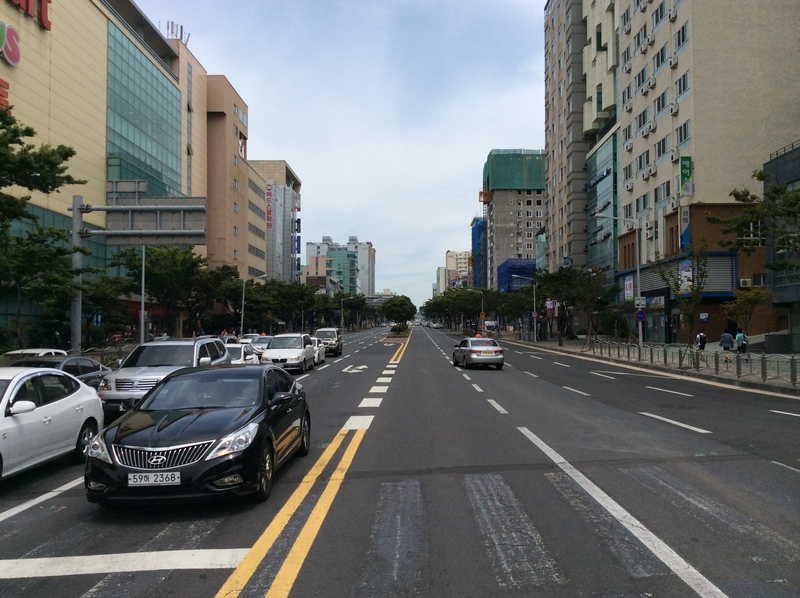 If you prefer the newly built uptown area, Sinjeju would be your choice. On the other hand, people who’d like to feel what Jeju City had been like in the past should go to the Gujeju(Old Jeju). 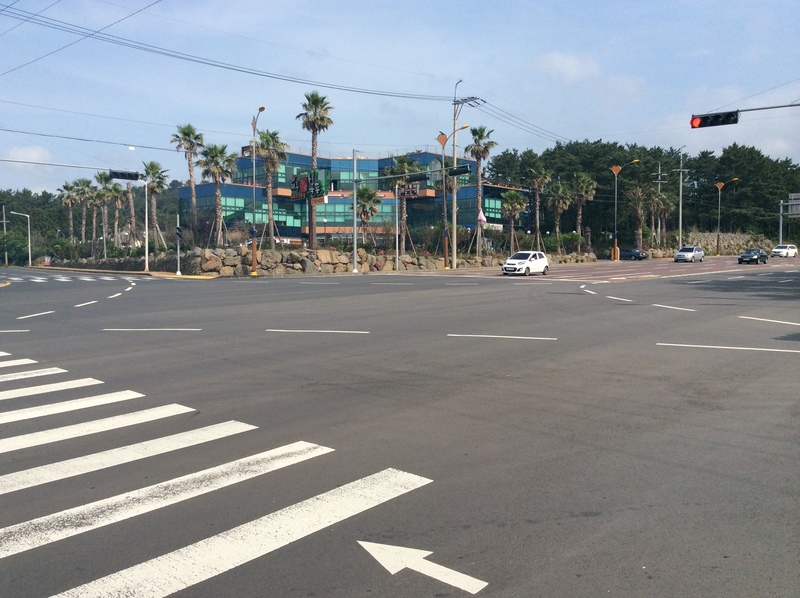 These two sections of the Jeju City are totally separated. To get to here from the airport, refer to my post titled, ‘Airport, where your journey begins.’ If you took the right bus, you’ll arrive at Shinjeju easily. 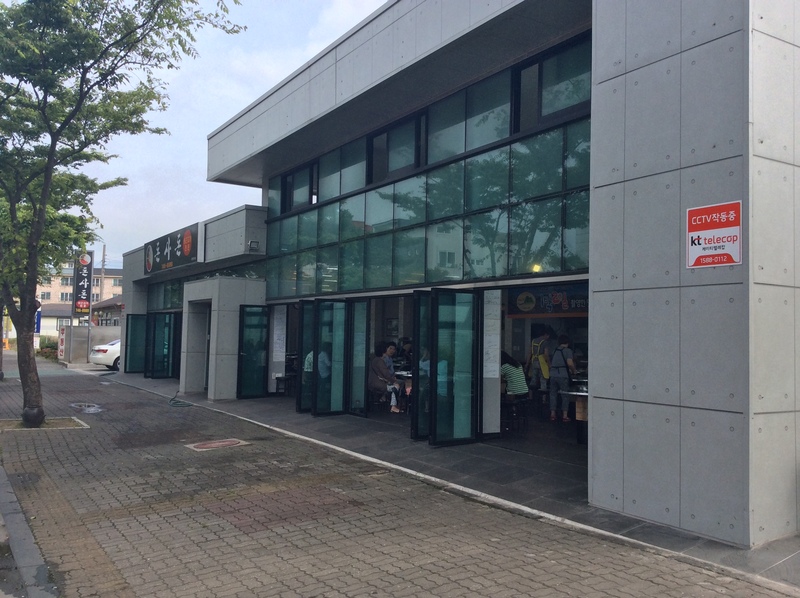 제주연동게스트하우스, Jeju Yeondong GH is the only GH I recommend in this area. Visit jejuolleh.kr for further info. 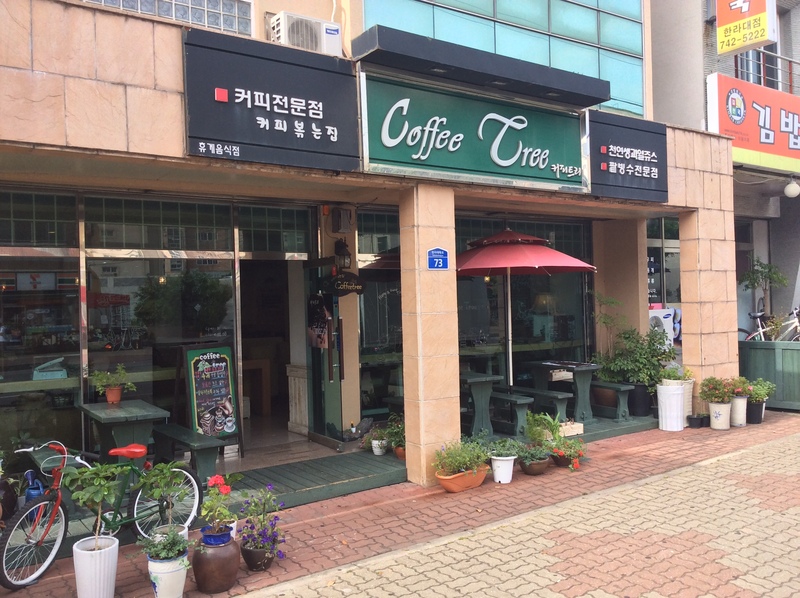 Owner doesn’t speak English, so you need a help from Korean or have to learn a bit of Korean to book this GH. 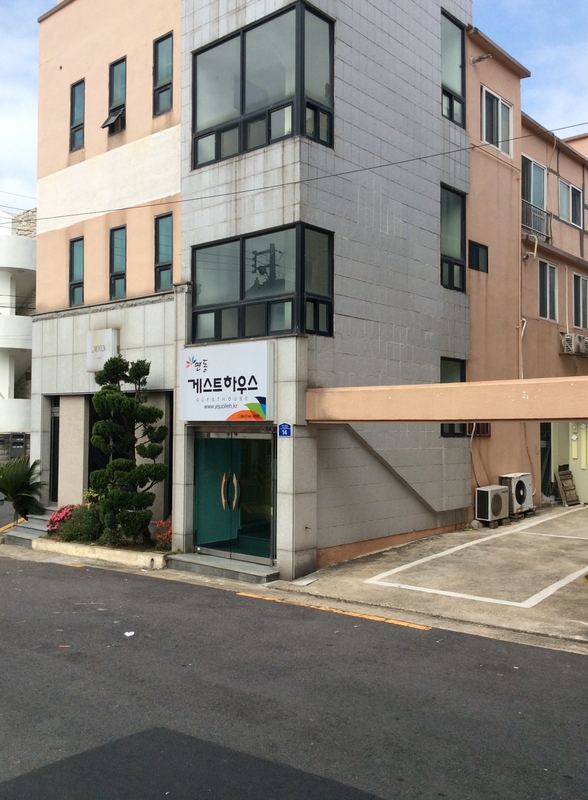 There are several Guesthouses you can book in this area, but most of the famous GHs are place in the Gujeju area(because rents are cheaper, and many motels were renovated to GHs. 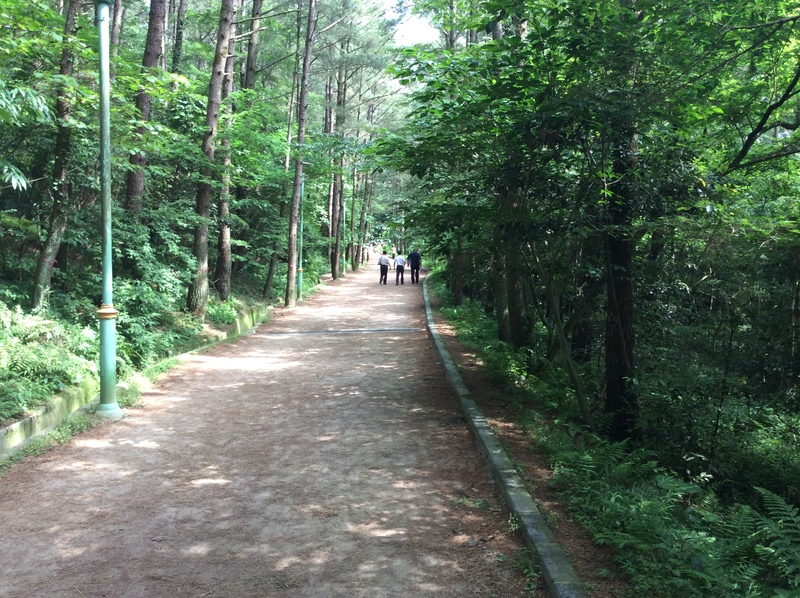 Greenday and The Forest are the GHs I recommend in the Gujeju area. 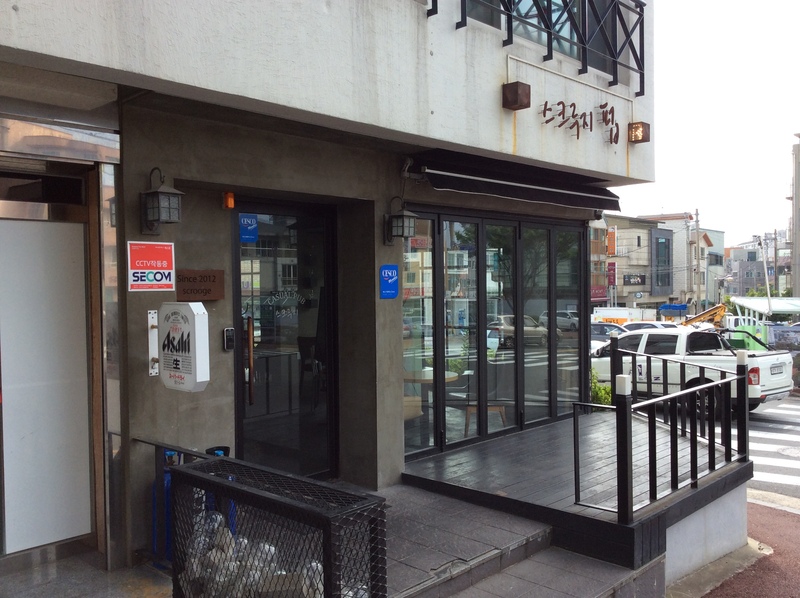 After unpacking your luggage, you might wanna take a look at the Shinjeju Newtown. 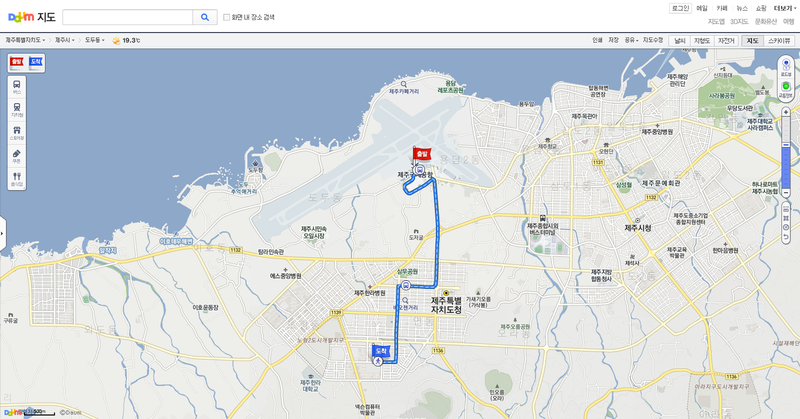 I will tell you which part of the Shinjeju you should visit. 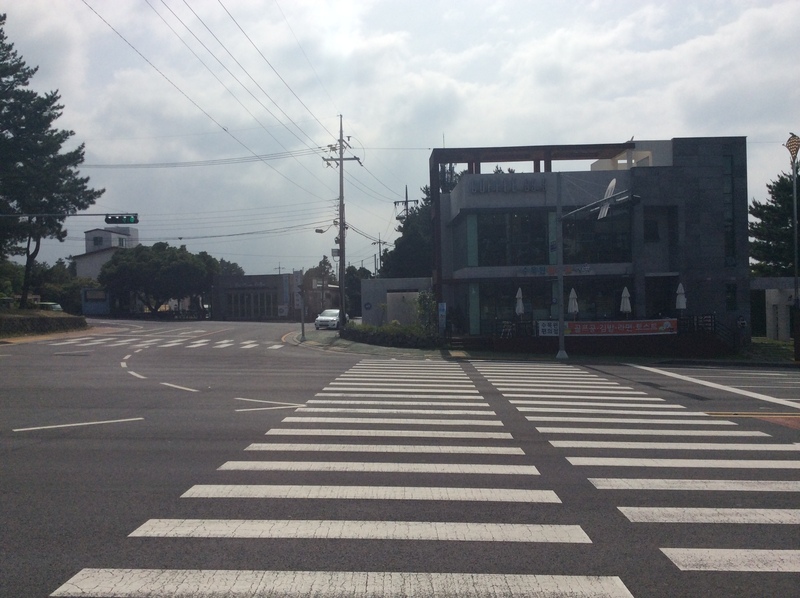 Parts of Jeju City where you can find plenty of coffee shops are marked in the map. As lots of coffee shops can be found in the area marked in the map, I would just point out some of the famous cafes where locals favor. 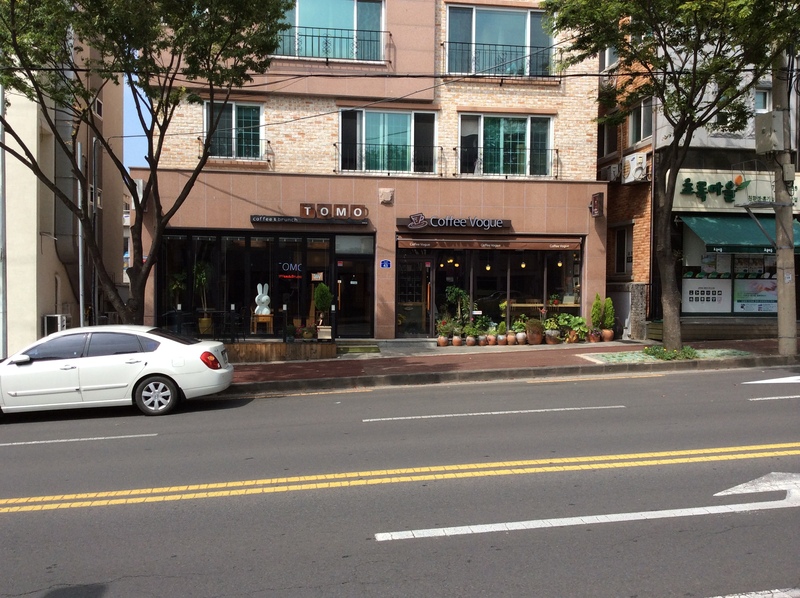 So-called ‘Cafes’ which I’ve mentioned below are placed along the streets near the mark ‘출발’ above in the DaumMaps. search ‘스크루지 펍 제주’ in DaumMaps. Sells good spaghetti and beers. search ‘아라파파 제주’ in DaumMaps. Famous for high-quality breads. search ‘이츠커피 제주’ in DaumMaps. Serves nice coffee. 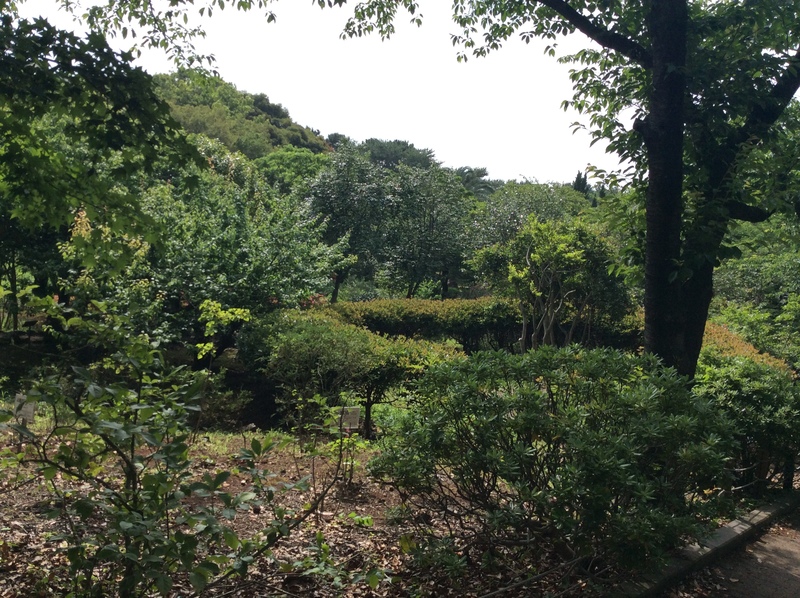 Now it’s time to take a walk to the hillside park named ‘한라수목원(Halla Arboretum).’ You are not too faraway from the back gate of Halla Arboretum from these cafes. 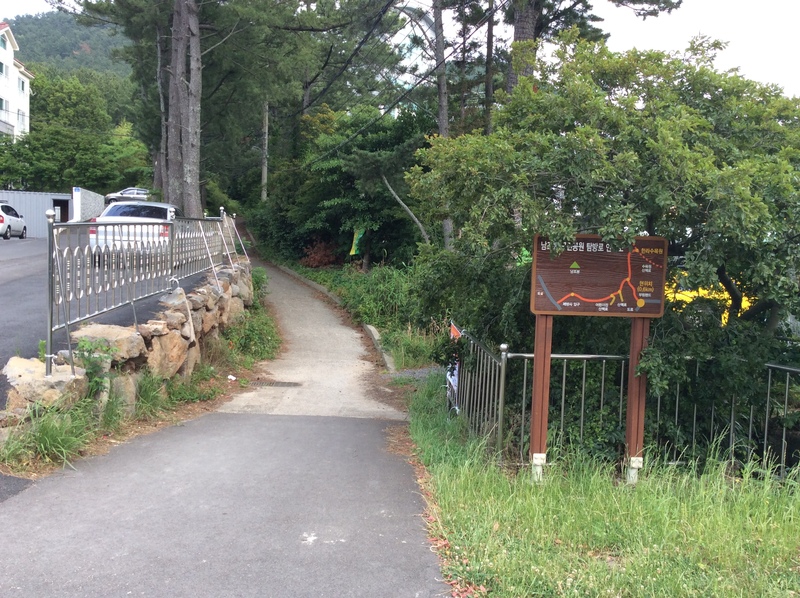 Walk for 10 minutes and you’ll soon find the signboard places at the back gate of the Halla Arboretum. Search ‘부림온천’ in DaumMaps. 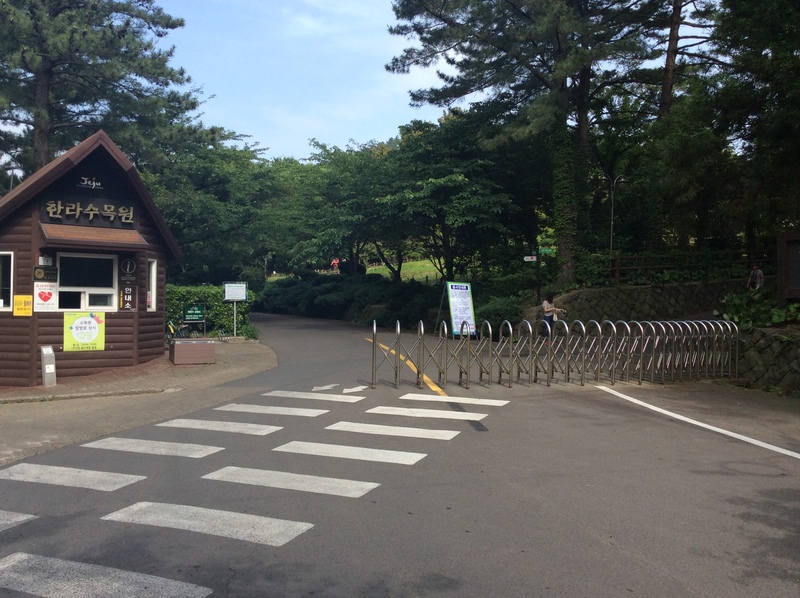 Back gate of ‘Halla Arboretum(한라수목원)’ is placed next to the Burim Spa(부림온천). 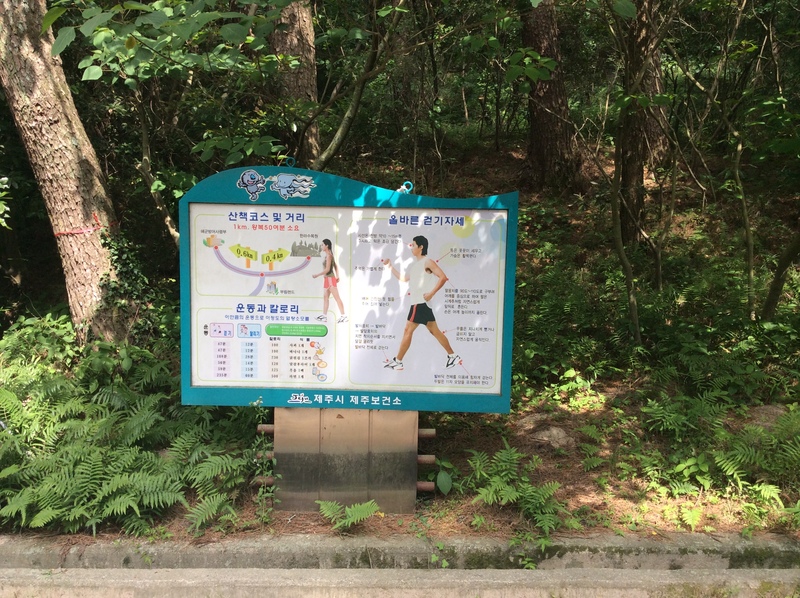 Due to its bad management, I do not recommend Boorim Spa(부림온천) placed next to the Halla Arboretum. 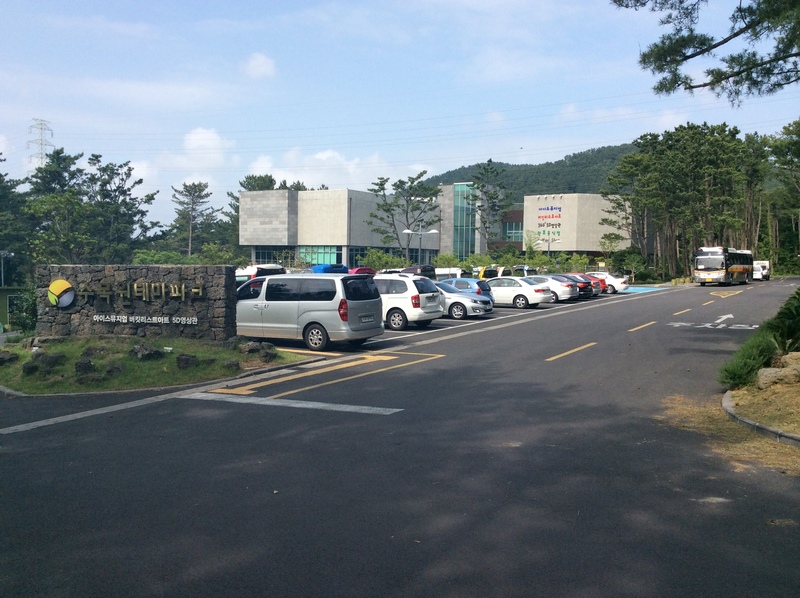 Visit Dodu Seawater Spa(도두해수파크) instead. Turn right when you see this signboard. Road to the Halla Arboretum. 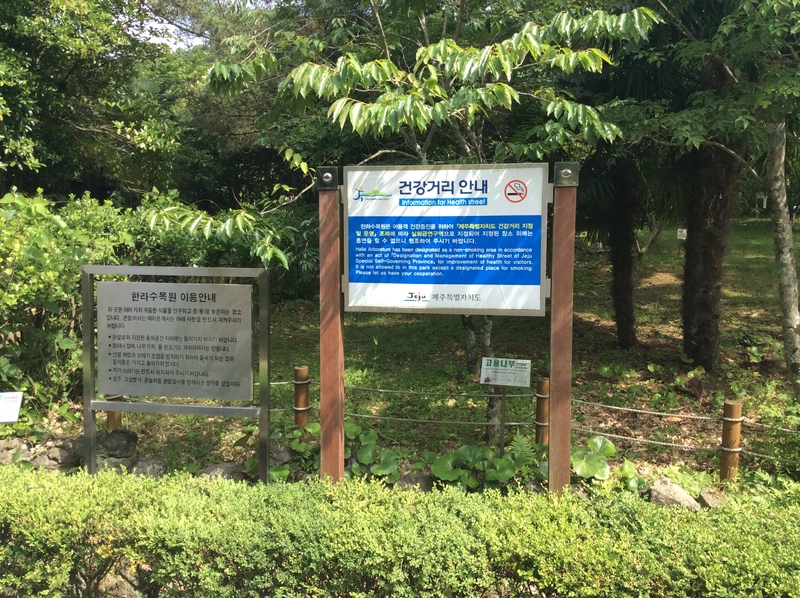 Signboard placed at the starting point of Halla Arboretum. View from the way up to the Halla Arboretum hill. Main gate of the Halla Arboretum. On your way out, you will see sign post showing way to a museum. Arboretum Theme Park seen from the outside. You could have a cup of coffee there and look around. 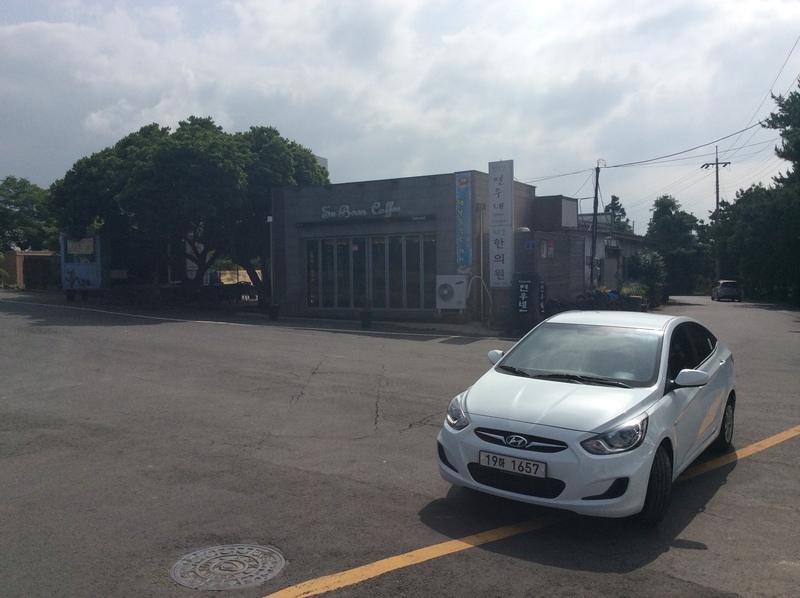 When you got out of Halla Arboretum, you will see a intersection where you can see a coffee99.9 cafe. 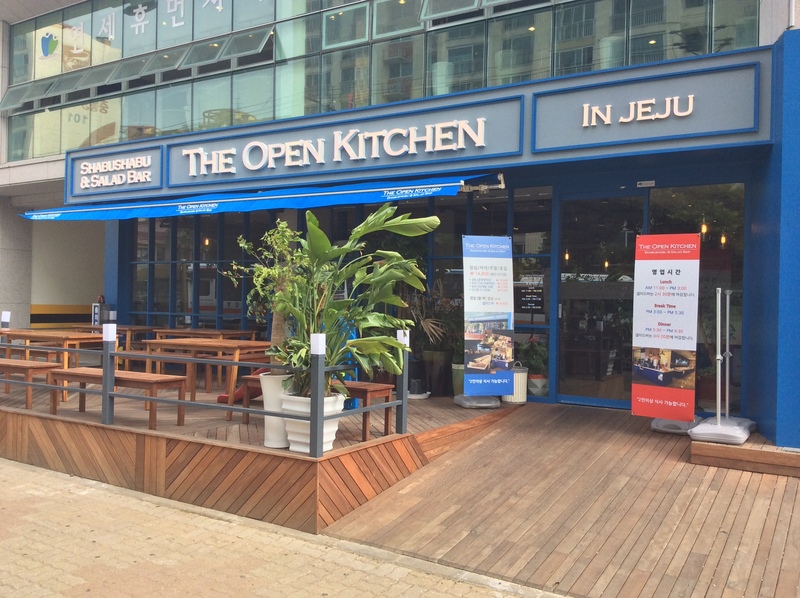 Before you cross the street, you can visit this huge restaurant which sells Korean-Style Pork Barbeque. 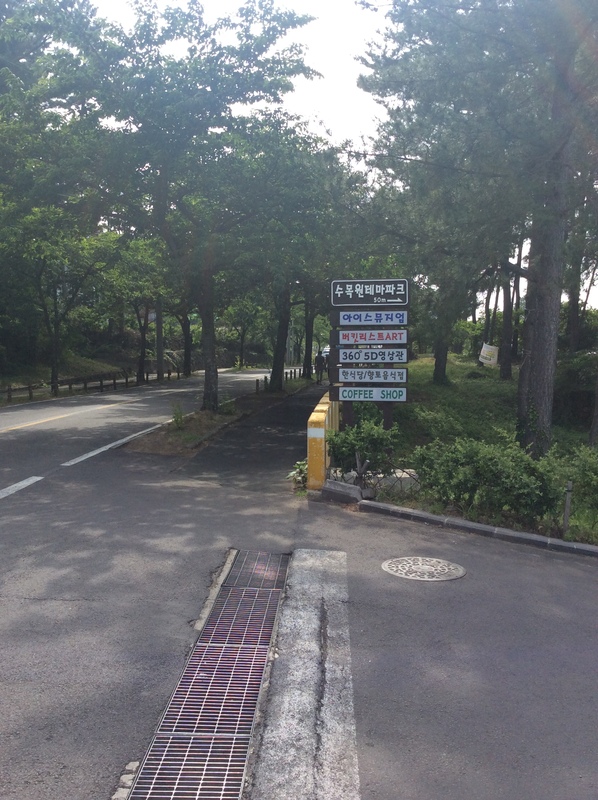 At the intersection outside the Halla Arboretum, there’s a cafe named SuBean Coffee. You’ll have to get off here to enter main gate of Halla Arboretum. On your way down, you will see a Cafe Philhamonic, European style. 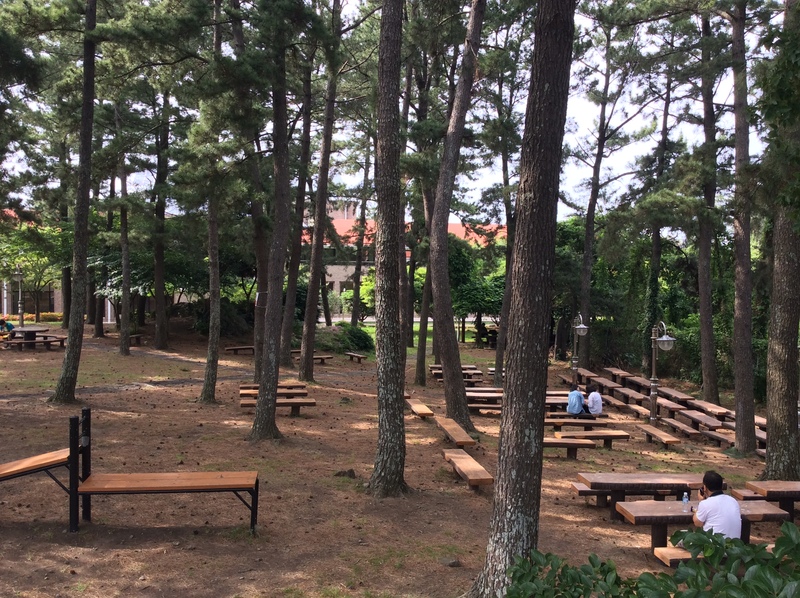 After taking a walk in the Halla Arboretum, you can head to the Coffee Shop Area near ‘제주한라대학교(Jeju Halla College)’ from the outside of Halla Arboretum with ease. Go downhills and turn left, you will soon find yourself there. 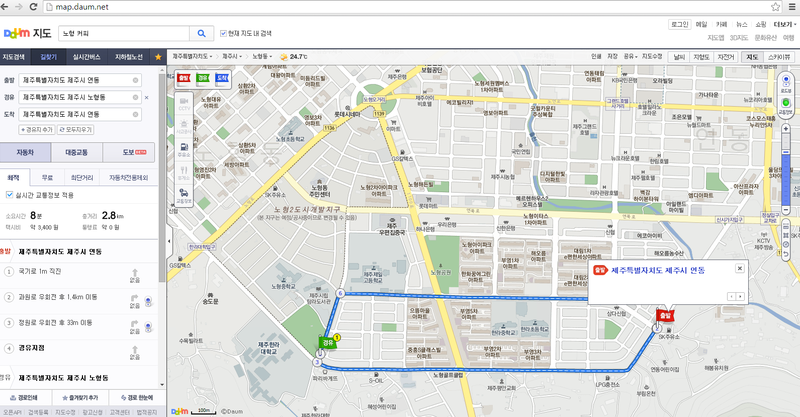 Search ‘디오픈키친 제주’ in DaumMaps. 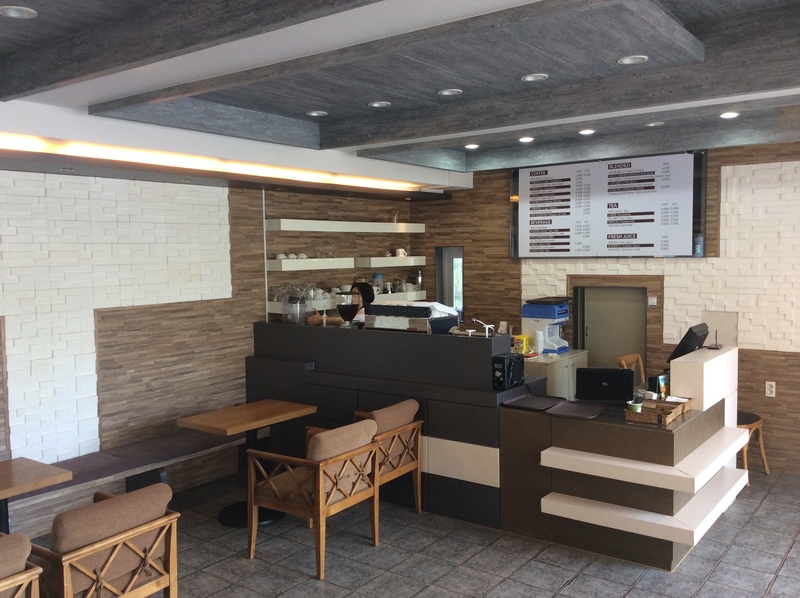 Newly opened, this place became famous for Japanese-style Shabu-Shabu. Search ‘커피트리 제주’ in DaumMaps. 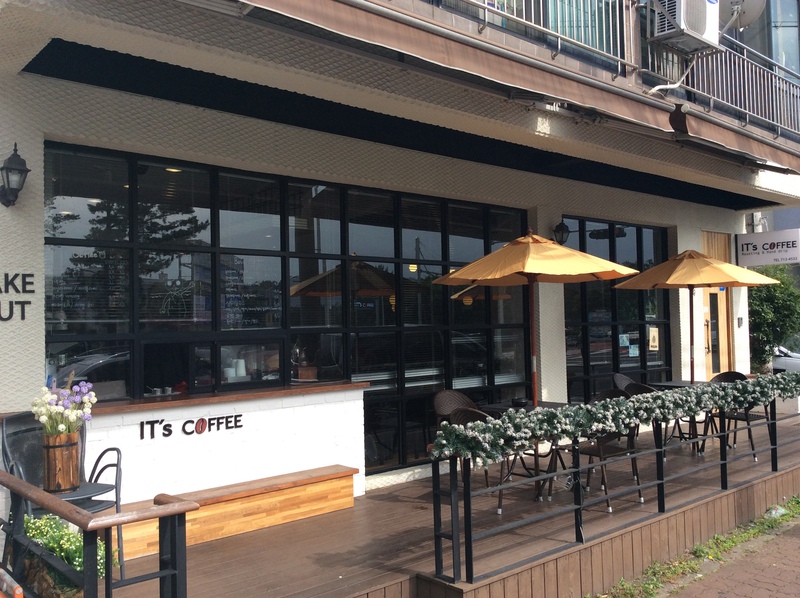 Famous for good coffee among locals near Jeju Halla College Cafe Street. 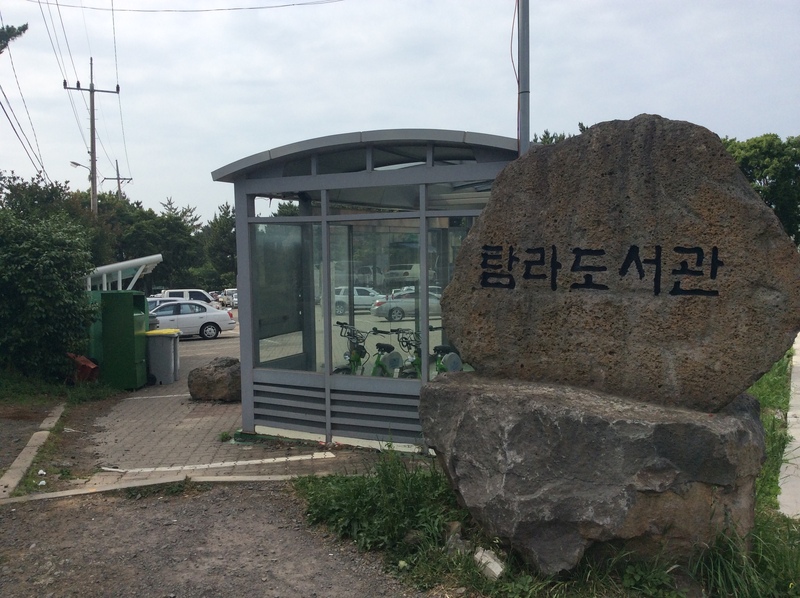 When you go down the road between Halla College and Coffee shop area, you will see a Main gate of the Tamna Library(탐라도서관) on your left side. Shelter outside the Tamna Library. Tamna Library seen from outside. Visit here to see the students and adults studying hard to become bureaucrats or get some kinds of licenses. 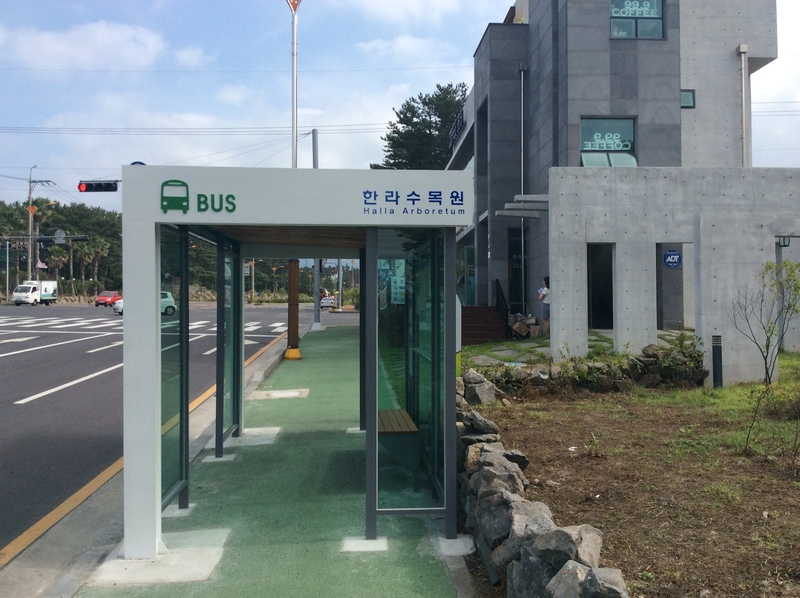 Bus stop near the Jeju Halla College. 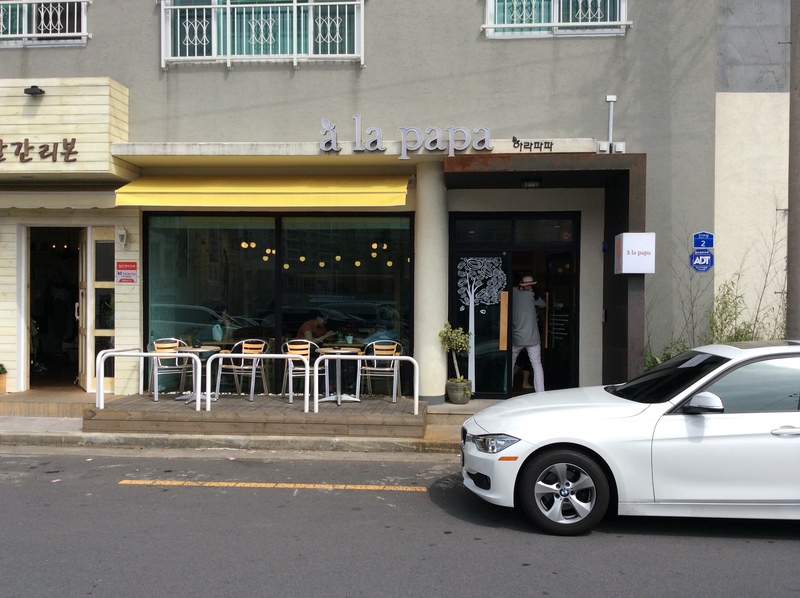 Go one more stop upside and you’ll arrive at a cafe street near the Halla College. 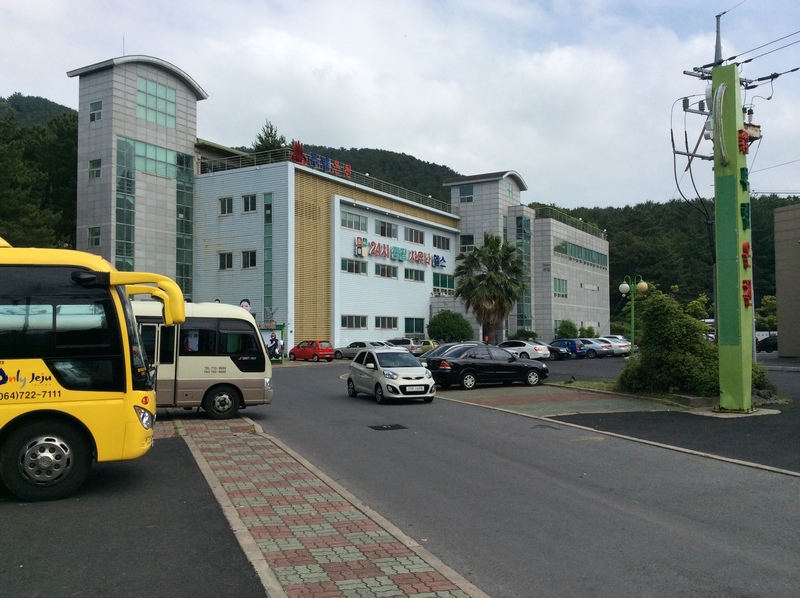 If you go down from Halla College, you will see Heuk Don Ga(흑돈가) on the right side of you. 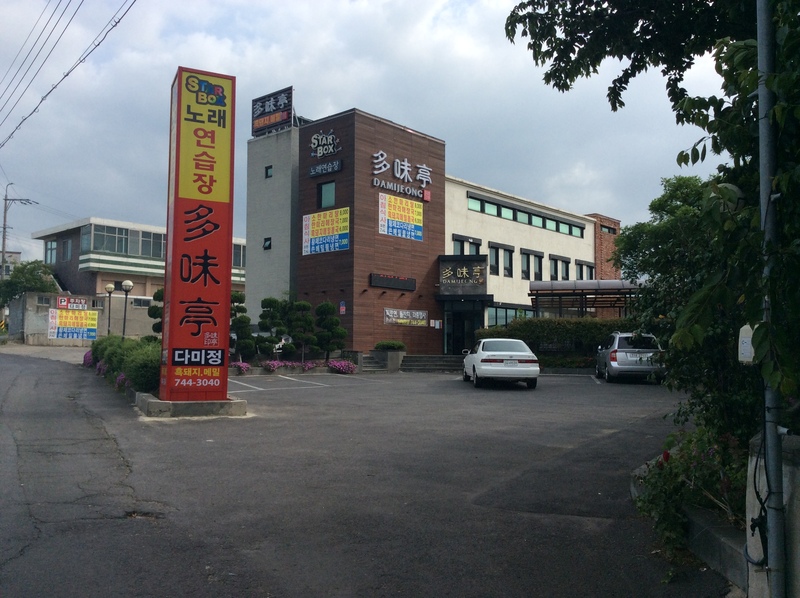 This is a famous Korean Barbeque Restaurant for tourists. But Locals go visit Don Sa Don(돈사돈) more down the street. search it in DaumMaps. 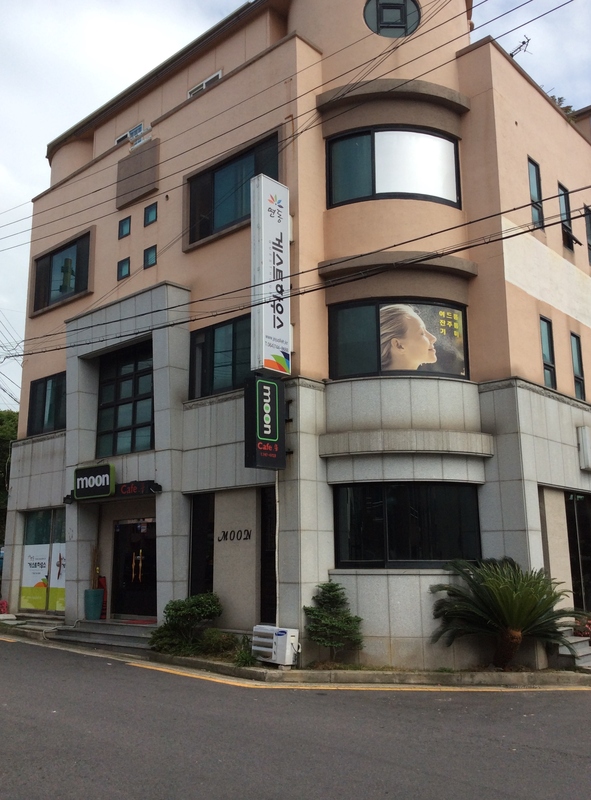 If you walk down more, you will find 다미정. This restaurant sells good black pig pork for a reasonable price. 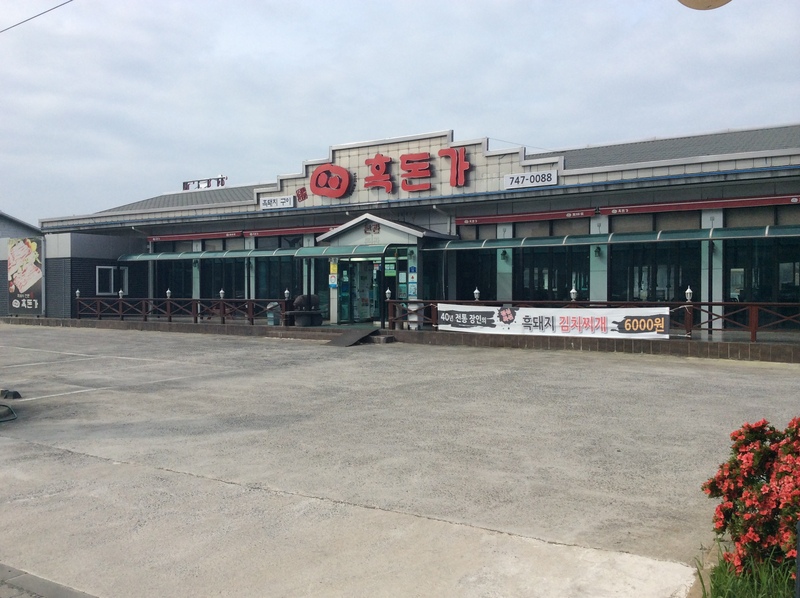 Best thing about this place is that you can sing in a Karaoke(which has the best facility in Jeju) for free after having pork meat here! As you’ve seen from the photos above, Shinjeju Area is more about city experience rather than nature itself. 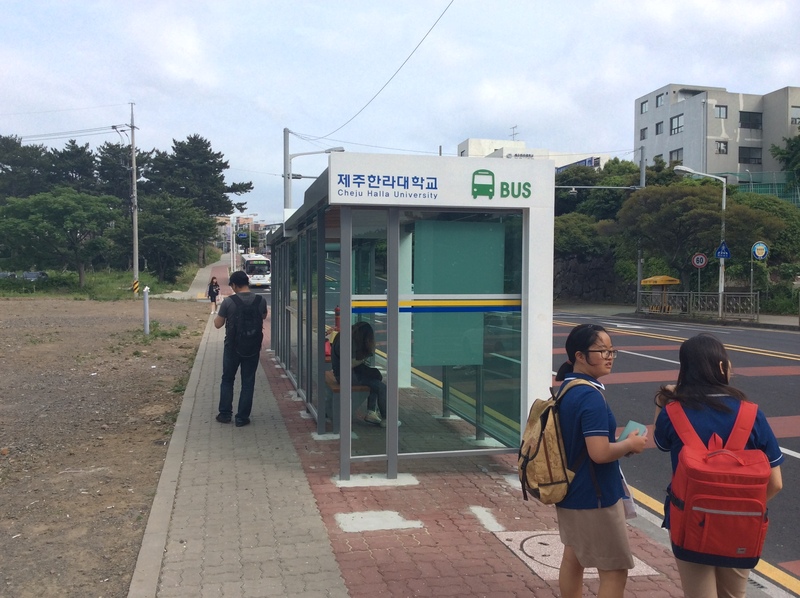 But one thing that makes the Shinjeju special is that it’s like a Seoul city next to the parks and forests with clean streets! 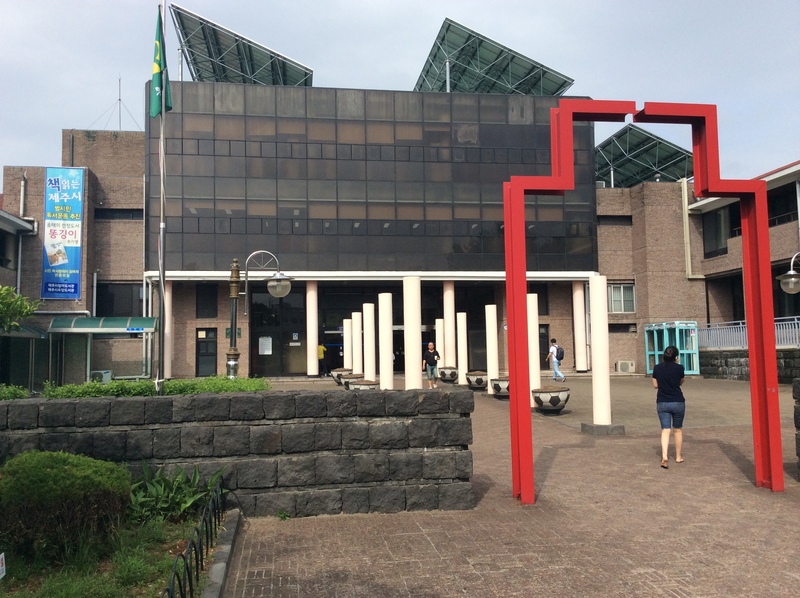 For those who would want more modern version of the Jeju city should definitely visit Shinjeju. 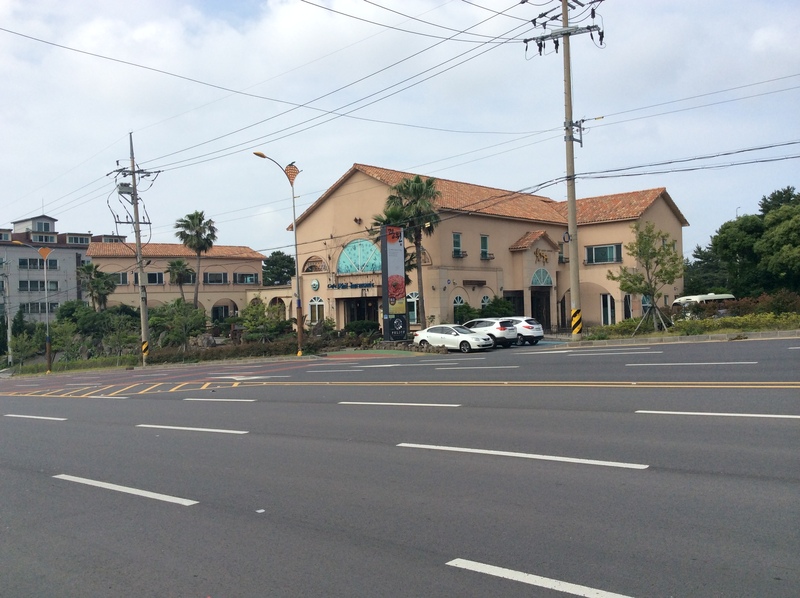 Since most of the foreigners who visit Jeju go to Gujeju, visiting Shinjeju would certainly be a great experience, and hope you could spend your night here and prepare for your travel.